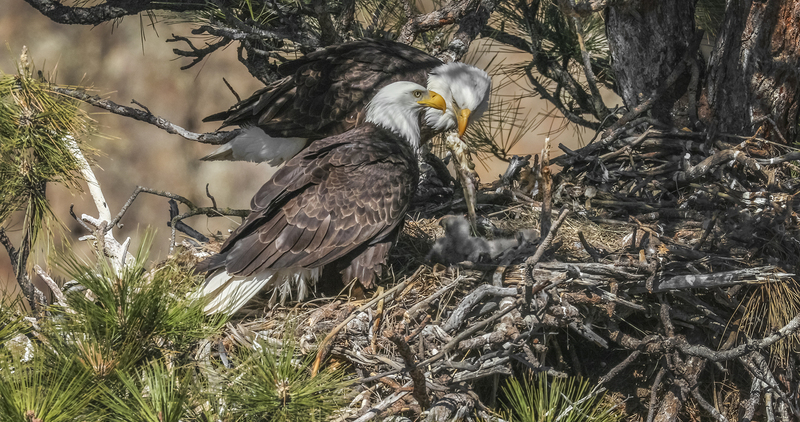 The video below is a compilation of 4K video footage shot by George Lepp on the EOS-1D X Mark II. So just how good are these 4K video frame grabs? We have a lot of frames (up to sixty per second), but are they usable? The two Canon DSLRs that currently offer 4K video (DCI-type 4K) frame capture yield a single-frame file size of 4096 x 2160 pixels, or the equivalent of an 8.8-megapixel (MP) camera firing in JPEG format. Compare this to a frame grab from the more commonly available 1080p HD video frame, which is the equivalent of a 2.1 MP camera. An 8.8 MP file size doesn’t sound usable if you consider that the last Canon EOS DSLR with a comparable yield was the EOS 20D in 2004 with an 8.2 MP sensor. After all, we now have Canon DSLR cameras with more than 50 MP! But the advances in DSLR capture have gone beyond file size; when I compare an image from my 20D from 14 years ago to an 8.8 MP frame grab from 4K video, I see a significant improvement in quality. The JPEG format of each frame grab from 4K video is the same as a standard JPEG file captured in non-video mode, and the quality factors of sharpness and color fidelity are similar. For smaller prints, publishing, and Internet use, there are no distinguishing differences between a video frame grab and a traditionally captured JPEG image file. As an additional advantage for wildlife photographers wanting more telephoto reach, note that when capturing 4K video there is an additional crop factor of 1.38X with the EOS-1D X Mark II, and 1.74X with the EOS 5D Mark IV, since the 4096 x 2160 pixels of the 4K format are directly pulled from that cropped central area of the full-frame sensor, rather than from the entire full-frame area. While still-capture rates of five to sixteen frames per second (FPS) have been a great boon to action photographers, video frames, at 30 or 60 FPS, offer much more. Even in continuous capture mode, you wouldn’t keep a DSLR firing non-stop for more than several seconds, depending upon the buffer capacity. Video yields an ongoing capture that normally lasts far longer—subject to the recording speed and size of the media card. And video capture is completely silent, unlike an ongoing shutter, even in “silent” mode. 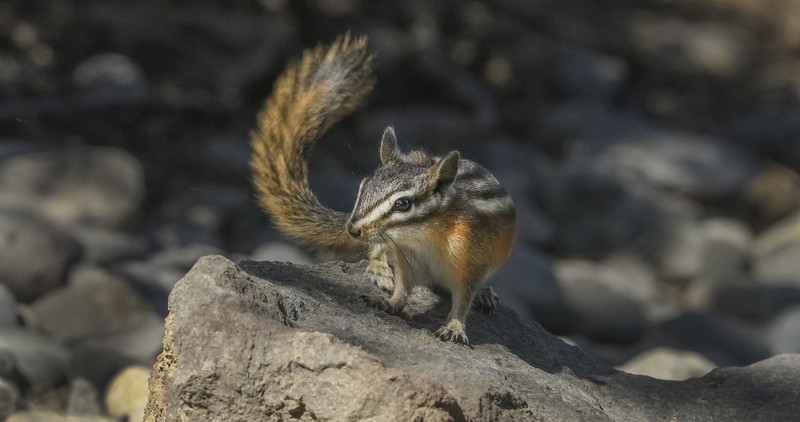 For wildlife and wedding subjects, this can be a critical advantage. Some of my 4K frame grabs of birds were captured from a photo blind situated only four feet away from the subject; the noise of a camera’s motor drive would not have been tolerated in such close quarters. It’s important to consider in advance the anticipated uses of video frame captures. The typical shutter speed in video capture is 1/60 second at 30 FPS, and 1/125 second at 60 FPS. 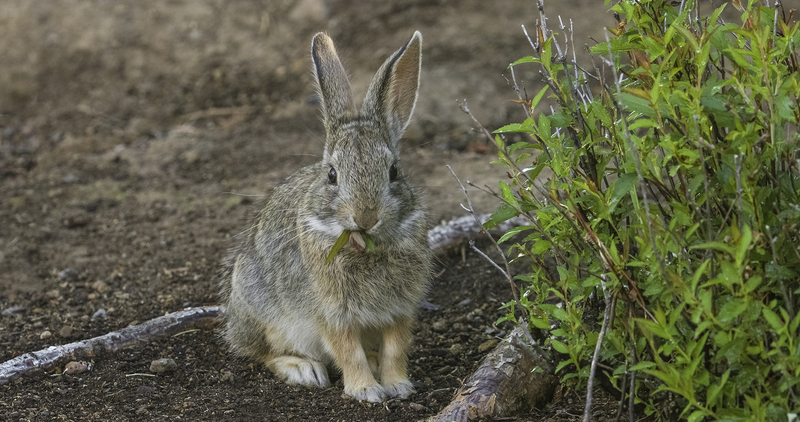 This may not be fast enough to yield sharp images in each frame when the subject is moving. If the purpose of your video is to generate frame grabs that capture a precise moment in time, it makes sense to employ both the fastest frame rate and the fastest shutter speed possible. 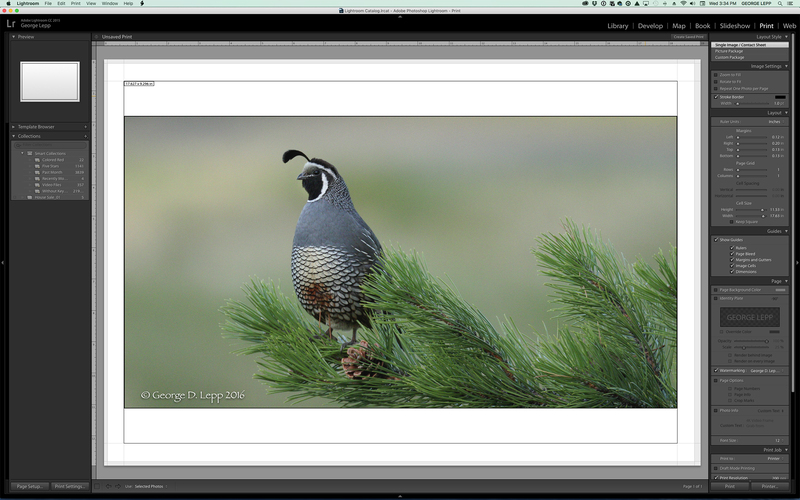 Some of the examples I show here are derived from extended video sessions with wildlife subjects that I followed for several minutes, using a fast shutter speed at 60 FPS; my sole intent was to gather a huge amount of high-quality images, assuring that from among them I would have captured the optimal moment for production as a still print. Both of the 4K-capable Canon DSLRs deliver a top shutter speed of 1/4000 second for video; the EOS-1D X Mark II offers both 30 FPS and 60 FPS video capture rates, and the EOS 5D Mark IV runs up to 30 FPS. 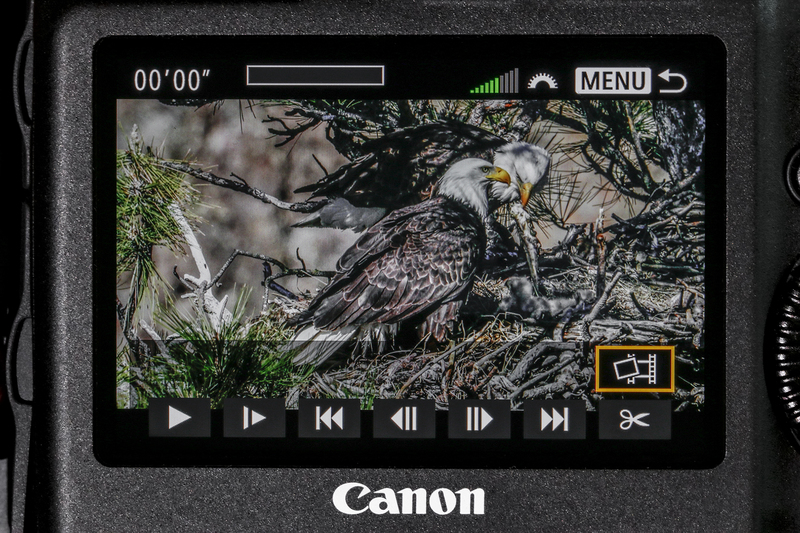 Note that 4K video recorded at 60 FPS in the EOS-1D X MK II requires a CFast 2.0 card, and you’ll need a fast, UDMA-7 compliant CompactFlash card for 4K recording with the 5D Mark IV. A tripod-mounted video fluid head is a useful accessory to keep the camera/lens steady as the photographer follows the subject—thus generating the largest possible number of sharp frames. The camera’s Dual Pixel CMOS AF helps to maintain critical sharpness as the subject moves around. I’ve been using an ISO of 1600, even in full sun, to achieve as much depth of field as possible (f/16) to insure the subject is in the zone of sharpness. In combination, a frame rate of 60 or 30 JPEG images per second, a shutter speed of 1/4000 second, Dual Pixel CMOS AF, and an ISO of 1600 leave little to chance. As with still photography, adjustments in ISO, aperture, and shutter speed will need to be made in varying light conditions and depending on the subject. And long video sequences are typically not the norm; I often capture very brief segments, while a “flighty” subject, such as a butterfly lifting from a flower, is exhibiting the behavior I’m looking for. Although the settings I have laid out here will optimize the chances for excellent frame captures, there are some additional considerations I should mention. When optimized for still capture, the resulting video will not be a good choice for general video playback. When played at 30 FPS, normal speed, it will have a staccato, or unsmooth effect because of the fast shutters; but at 60 FPS, it might produce a very interesting slow-motion presentation, where each frame will be very sharp and the action will be easily followed in the greatest detail. Additional factors to consider are that the slowest shutter speeds possible are 1/30 second at 30 FPS and 1/60 second at 60 FPS. Flash is not possible, but continuous light sources are. The auto-exposure capabilities of the camera will need to be over-ridden so that the shutter speed, f/stop, and ISO can be manually set. Photographing through the viewfinder is not an option; use a loupe on the rear LCD to frame and monitor exposure and AF. And finally, a crazy phenomenon called “rolling shutter” can creep into your imagery when the speed of the action coincides with the speed of the shutter, distorting the fast-moving wing tips of insects or birds. You may have seen similar results in video of an airplane’s propeller, where the blades appear to be bent and detached. In the following text and illustrations, we’ll discuss four utilities and programs that can be used to isolate and save 4K video frame grabs. In the camera’s review function, the video can be viewed frame by frame on the rear LCD, and selected frames saved as JPEG files on the camera’s media card. 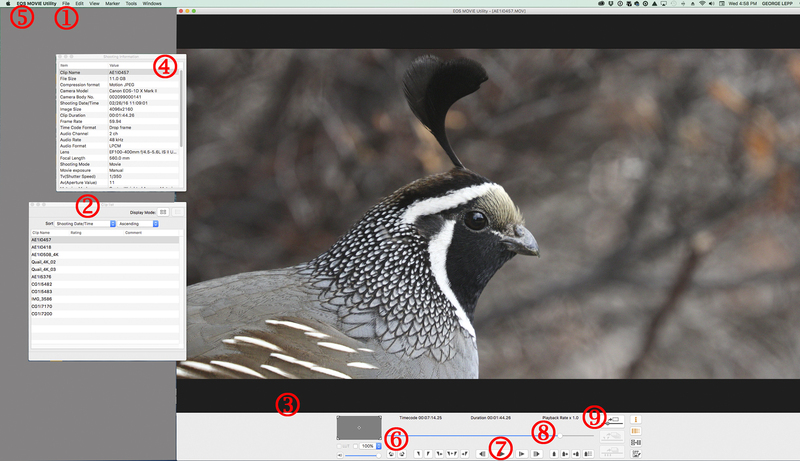 For computer review, Canon has a great utility called the EOS MOVIE Utility where the video clip can be previewed, “scrubbed” through, and the desired frame(s) selected and saved. Adobe Lightroom® has a hidden function when reviewing video that allows searching for, selecting, optimizing and saving individual frames. Photoshop CC outputs the frames from a short clip as layers—a more complicated process—from which individual frames can be chosen. To download the free Canon EOS MOVIE Utility, visit www.usa.canon.com and look under Software, Drivers and Downloads for your camera. The software can be used to view video files from any Canon camera. For the purposes of this example, we’ll be reviewing a 4K video file from either the EOS-1D X Mark II or EOS 5D Mark IV camera with an Apple® computer. Note that if the original 4K video file has been modified by any other editing program, frame captures can no longer be extracted in EOS MOVIE Utility. If you want to trim the video or work on it in another video program such as Apple Quick Time®, Final Cut Pro®, iMovie®, Adobe Premiere® Elements, or Adobe Premiere Pro, keep an original copy of the video file for extracting frame grabs in the EOS MOVIE Utility. After opening the program, select “File”  and click on the submenu “Open.” From among the options displayed, select the folder that contains the 4K video to be edited. Click “Open” at the bottom of the folder menu; the “Clip List”  window will display the names of all the videos in the folder. Highlight the selected file and it will display in the video window with the controls below it . If the window titled “Shooting Information”  does not display, activate it under the “View” menus. This is one of the few places where technical information about captured videos, such as the camera used, the frame rate, shutter speed, aperture, lens, etc. may be accessed. Before capturing a video frame, designate a folder, file name(s), and file type to receive and save the file; click on the EOS MOVIE Utility menu  and select “Still image capture settings” to make these choices. If the video was captured in vertical position, rotate it here . This is a compositional advantage for 4K video intended for frame capture. Move through the video using the four control icons  or the slider . At the upper right end of the slider is the “Capture Still Image” icon . Click on this icon and the frame visible in the video window will be saved to the destination you have previously designated. Later versions of Adobe Lightroom CC will play back video clips. Bring the folder that holds your 4K videos into Lightroom and click on the video that you want to review for possible frame capture. The video will show up in the “Library Module” view . Use the slider below the video window to play or scrub through the file. Click on the gear symbol  on the far right end of the slider and a set of small images representing the video frames will appear. Use the video play icons  to move quickly or by single frames through the video. When the desired frame appears in the video window click on the square symbol to the left of the gear icon to open frame options. “Capture Frame”  saves the image as a JPEG in the folder with the video. “Poster Frame” replaces the default first frame in the video as the image that represents the video in the Library. A nice feature of Lightroom CC is that the video frame grab that was just created as a JPEG can be directly sent to a printer. Additionally, the new file can be easily sent to Photoshop CC for additional optimizing, and the finished file automatically shows up in Lightroom. 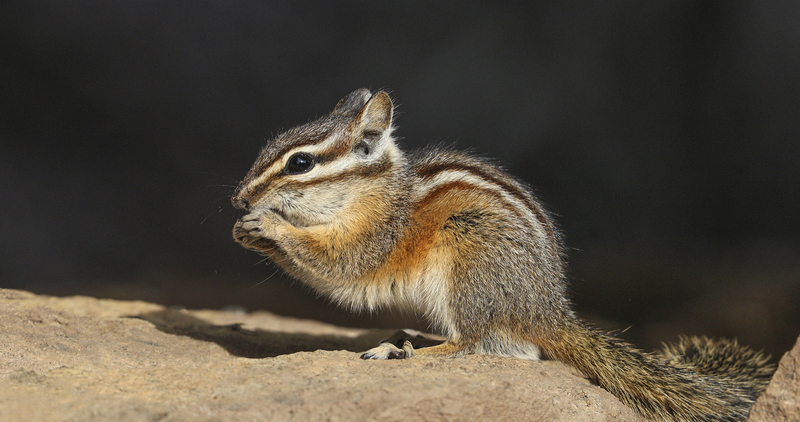 I can then send it to my Canon Pro 1000 printer for a print of up to 17 x 22 inches. 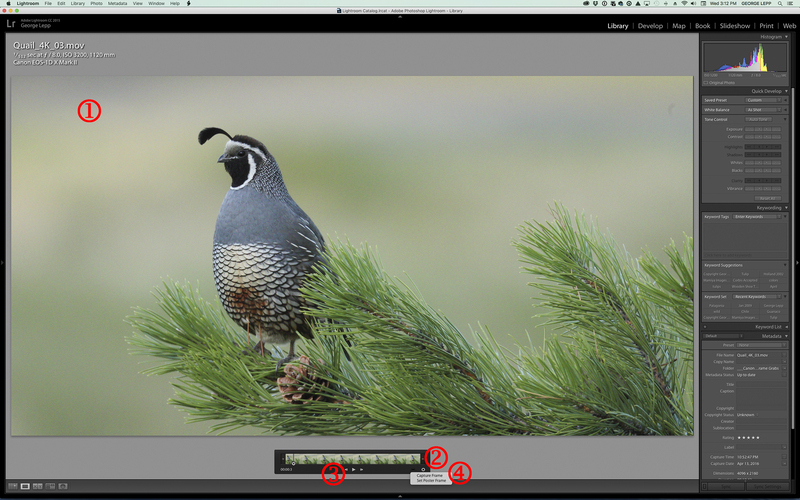 Frame grabs can be accomplished in Photoshop, but the process is complicated. Here’s the workflow. Open Photoshop and go to “File” > “Import” > and click on “Video Frames to Layers…” From among the folders displayed, choose the one that holds your 4K videos, and double click on the file you wish to open. A new menu with a (very small) video screen will display. 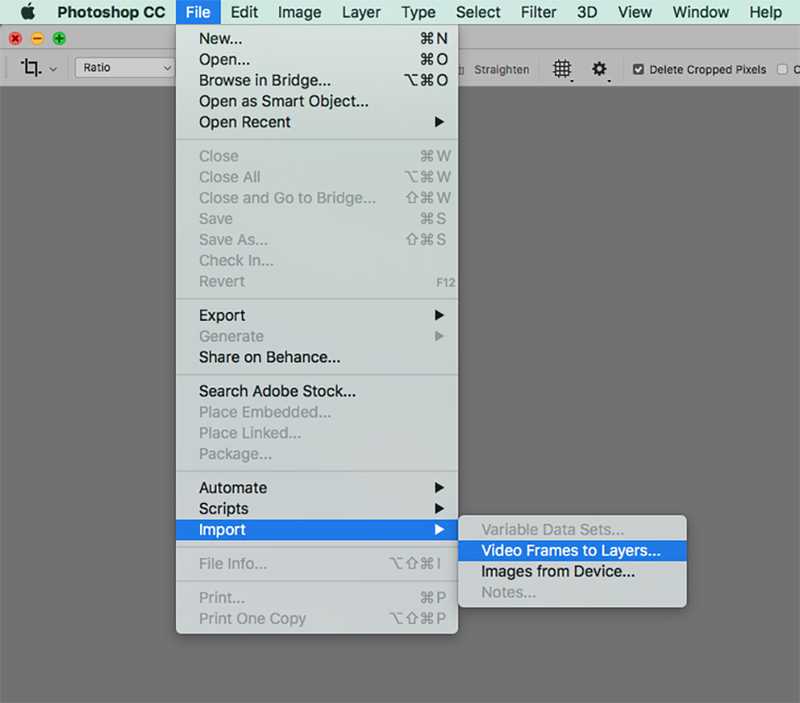 The menu to the left of the video gives the options for “Range to Import,”  that is, the segment of the video that will be imported into Photoshop Layers so that it can be examined frame by frame. I recommend you use “Selected Range Only” . Note that Photoshop allows a maximum range of 500 frames; it is advisable to narrow the count to a more manageable number. To select the sequence, use the scrubbing bar (slider) and media controls beneath the video to locate the general location of the desired frame(s) . Below the video is a scrubbing bar to find the general area of the desired frames. Position the two trim controls  below the bar to specify the range. Click “OK” . The frames contained in the selected range will appear in the “Layers” palette , each with an active “eyeball” . 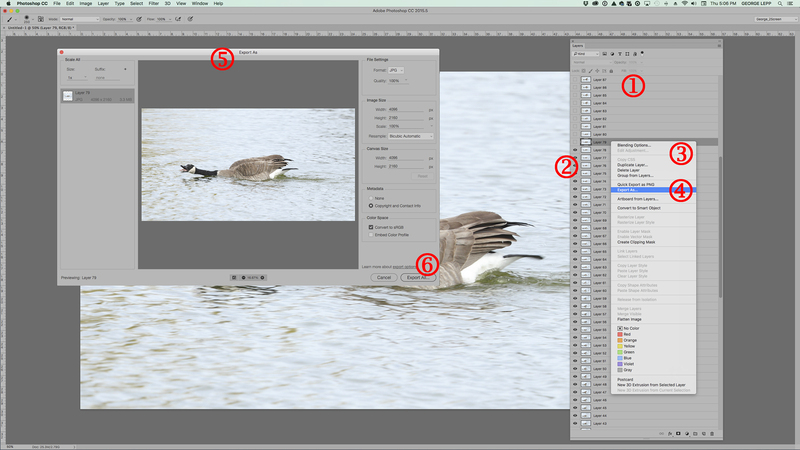 To view the individual frames, start at the top of the list and click “off” each eyeball to reveal the layer beneath it, until the image file you want to extract is active in the Photoshop window. Right click on the layer and a new menu  will appear. Click on “Export As…” , which will generate another menu  in the middle of the PS window. 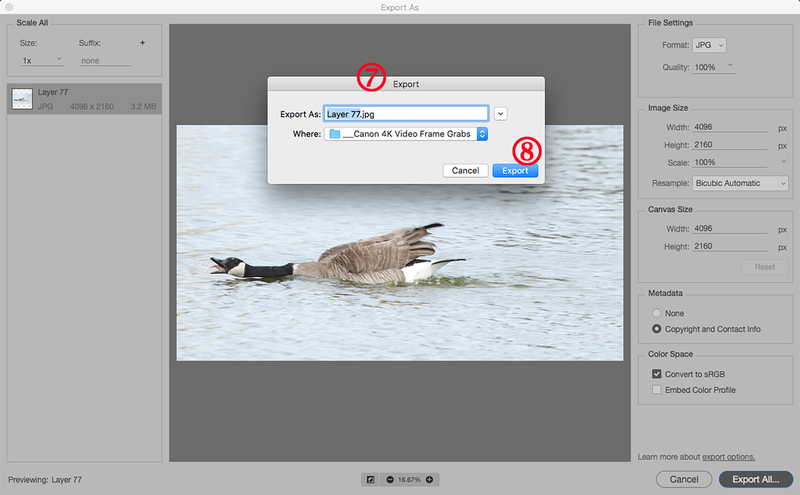 If the image in the “Export As…” is the one you want, left click on “Export All”  in the bottom right. Yet another menu will appear, “Export,”  with the choice of “Export As:” where you will name the file, and “Where:” to designate the location of the saved file. Click on “Export”  at the bottom right to send the file on its way. Once you’ve grabbed the definitive shot, post-process as you would any other still, optimizing the file for composition, color, clarity, contrast, and cleanliness, and to add a copyright notice. Then, print, project, and/or post. The files, equivalent to captures from an 8.8 MP camera and in the form of a JPEG file that is approximately 25 MB in size, can be printed with excellent results up to 13” x 19” and 17” x 20.” In my comparative tests, prints in the 19-20” range made from the 25 MB frame-capture files cannot be distinguished from prints derived from larger files. For those who give photography presentations via an HD projector, the screen quality of optimally captured and processed 4K frame grabs is, like all digital imagery, limited to the resolution capability of the projector. We’re just now seeing 4K-capable portable projectors, and 4K video and frame captures can be viewed in their full glory on a 4K TV. Web posting doesn’t require a very large file at all. In most cases, the frame-grab file will need to be downsized to fit a web format. No matter how they are presented, the big deal about 4K video frame grabs is the content: they offer the photographer an enhanced opportunity to capture and share the peak action, the nuance, the expression, the definitive moment. I believe this technology is a significant event in the digital revolution, and that it may soon become the preferred strategy for photographing and understanding subjects engaged in complex physical or emotional action: wildlife, flying birds and insects, dancers, athletes, wedding parties. Looking forward, we’ll be talking about 8K (7680 x 4320) video, with 33 million pixel frames—four times the pixels of 4K, and 16 times the resolution of HD video. That’s only a few years away. In the meantime improve your video skills, because video just may be the future of still photography.